Planting out your new plant. Before planting check beneath the leaves for pests. Rinse the entire plant under the tap to be on the safe side. With some plants, such as rose bushes, you may soak the roots in water mixed with a little bleach to further safeguard from pests and disease. Be sure your planter has proper drainage with clean stones, shards of terra cotta, a coffee filter or a screen over the drainage hole. Fill the planter with a cocering of about five centimetres of planting medium to about the where the plant's roots will reach. 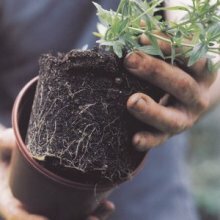 Centre your plant in the pot, and if necessary, carefully spread out the roots. The top of the roots or, base, should be about an two and a half centimetres below the rim of the planter. 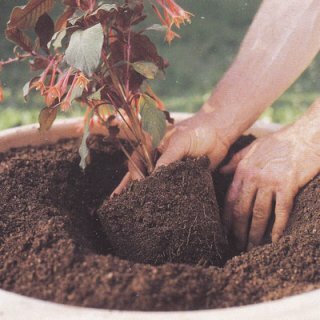 Then fill the rest of the planter with growing medium and firm it down over the roots. Do not pack the planting medium so tightly that you cause drainage problems. Then water the plant thoroughly to set the roots and mulch to finish off. There are dozens of combinations and styles that can be achieved when planting up planter displays. There are no set rules and I would encourage you to experiment with your own design ideas and not to let minor setbacks put you off. 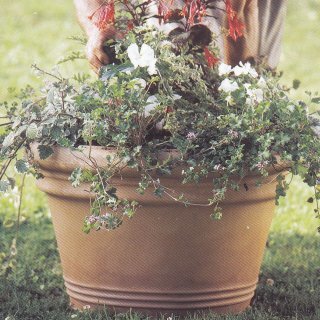 The following step-by-step method is intended to show you the basic skills in planting up a large traditional - style planter where one tall feature plant is surrounded by a mix of smaller flower and foliage plants. Knowing the different growth rates, heights and spreads of your plant selection helps to produce a well-proportioned display. With less familiar plants, however, this understanding only comes with experience as plants do not always behave as described on their label, and one may thrive in a planter setting while another may fail. To establish each design, I think that it is easiest to work with the actual plants. Keep them in their plastic planters and arrange them on the surface of the potting compost so that you get a visual idea of how they will all fit together in the display. Once you are happy with the effect, arrange the plants in the same pattern on the ground and then one by one. Lift them out of their planters and plant them up. Establish your central feature plant and then work out from this point, planting up your tallest growers first and gradually moving down the scale to your shortest. Plant in a systematic way so that plants of the same size are evenly spaced across the planters surface. Even though some plants are small, I always try to use them to best effect in an arrangement. To achieve this, I often tilt the plant on its side so that its best foliage or flowers face out towards the dm of the pot. 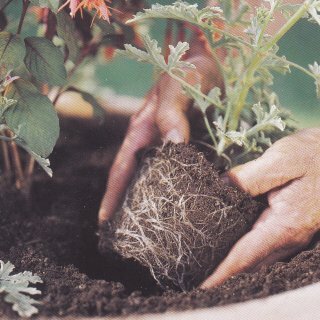 Some of the root ball may be left exposed on the soil surface but as long as it is kept moist the plant will thrive. Once you have finished planting up, add some more potting compost to fill the planter to about 2.5cm below the rim. Take a look at your finished efforts to see, even at this early stage of plant growth, if the arrangement looks balanced. Reposition plants if you need to. When you are satisfied, water the display thoroughly.